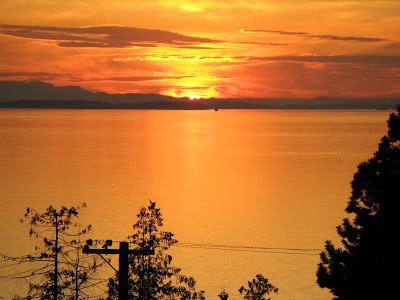 We returned town in Powell River to see this awesome sunset from our balcony. The view is northwest towards Vancouver Island. I think you can guess why they call this the Sunshine Coast. If you haven't made your summer holiday plans, this is the place to come. It is uncrowded, lots of outdoor activities for all ages, and friendly people. Want more information? Now that is stunning! You really do have the best seats in the house and I'd love to visit someday! Beautiful! Many years ago I was fortunate to hop among some of the islands by car. That was fun! Except for Vancouver, I can't recall the name of the other islands. Beautiful! The Pacific Coast definitely has the best sunsets! You convinced me with the word sunshine. Beautifully calm sunset. Absolutely beautiful sunset and lighting! I hope you and Wayne have many more glorious summers "up the coast"!